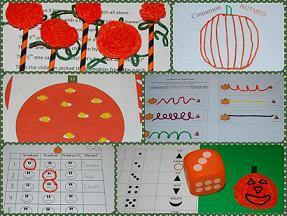 Wikki Stix Pumpkin Activities for Learning and Play! Kids love pumpkins! If you have a chance to visit a local pumpkin patch or farm, picking pumpkins is a fun family activity to do with children. Even if your location doesn’t offer opportunities to visit a pumpkin patch, the Wikki Stix pumpkin activities below are designed to encourage learning through play with a fun pumpkin theme. Print the 5 Little Pumpkins rhyme (linked above) and read the rhyme to your children. Have the children hold up fingers as the rhyme is read. As the children become more familiar with the rhyme, they will want to read/chant it over and over! 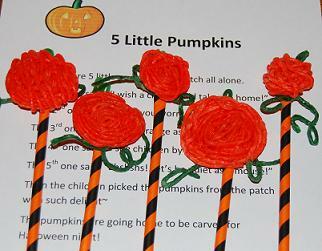 Storytelling: Invite the children to create 5 Pumpkin Stick Puppets. Make a tray with craft sticks or straws and the orange/green Wikki Stix to invite the children to craft and play. 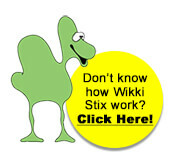 When the children learn the rhyme, they can act out the rhyme with the Wikki Stix created stick puppets. Invite the children to create scenery for their stick puppet play with Wikki Stix. Brainstorm with the children examples of items they might wish to create: a field, pumpkin vines, a house, stick people (for the children in the rhyme), a mouse, and/or a jack-o-lantern. What other things might the children create to enhance re-telling the rhyme with the stick puppets? Materials needed: One printable file (linked above), scissors, and yellow Wikki Stix. Teen numbers are often difficult for younger children to grasp. The file (linked above) ONLY concentrates on numbers 11-19. Print the file for your children and laminate for durability (clear contact paper works if laminating supplies are not available). Ask the children to cut small pieces of yellow Wikki Stix (Wikki Stix can be cut with safety scissors, but younger children may need assistance). The yellow pieces will become the pumpkin “seeds” as the children place them one-at-a-time inside the white ovals on each of the pumpkins. Have the children count out loud as they place each Wikki Stix “seed” on the counting mats. Using Wikki Stix will help reinforce counting skills (the Wikki Stix will adhere to the pumpkin so no counters slide or “drop off” the paper while the children are counting). Materials needed: Assorted colors of Wikki Stix (Super Wikki Stix work well for the line/path creations) and one file (linked above) for each child. Read the directions to the children. Ask the children to recreate any of the paths in the boxes (near the top of page 1) to make a path for the Jack-o-lantern to get to the Haunted House. The children do not have to use the same box colors for the created paths. 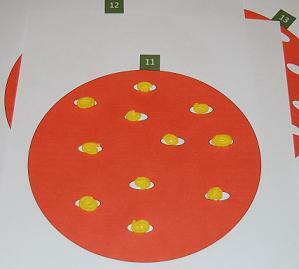 If you have the corresponding colors available, it will help the children with color recognition skills, too! 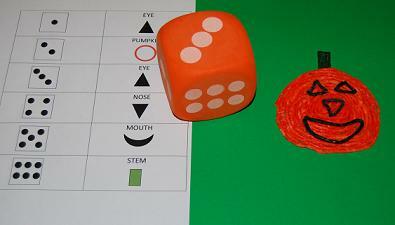 Materials needed: One printable file (linked above), one die, and black/green/orange Wikki Stix. Have the children roll one die, count the number of dots, and create the corresponding Jack-o-lantern part with their Wikki Stix. The children should continue rolling until all numbers have been used and the part created. The children can make any size of Jack-o-Lantern desired. It is a fun activity to reinforce basic counting skills while using tactile skills to create! Save the Jack-o-lanterns from the game and display them for Halloween! Materials needed: White mounting paper (copy paper, construction paper, or scrapbook paper), orange Wikki Stix, one printable recording sheet (linked above), and assorted fall spices (examples: nutmeg, cloves, cinnamon, apple pie spice, pumpkin pie spice, poultry seasoning, mustard seeds, and/or sage). 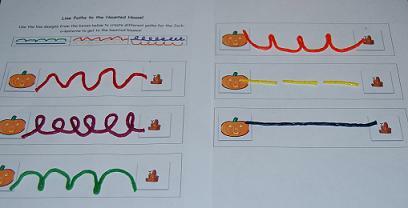 Have the children create any kind of pumpkin desired on the mounting paper with the orange Wikki Stix. Carefully have the children shake their chosen spice onto the Wikki Stix created pumpkin. The spice/seasoning will adhere to the Wikki Stix pumpkin for the children to smell. 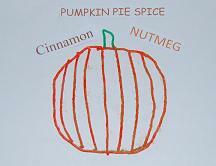 Let the children experiment with different fall spices/seasonings. 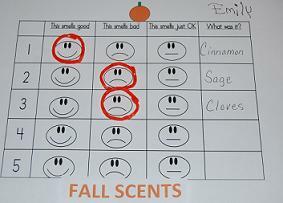 If doing the activity with a group of children, have the children exchange pumpkins and smell the different spices. Recording Sheet Instructions: Help the children label the worksheet with the spice(s) that were used during the smelling activity. The children can record whether they liked, disliked, or thought the spice was “just OK” by circling the corresponding face with Wikki Stix (see photo below). Olfactory games are powerful for children. By experimenting with sensory activities, children will become familiar with how we use our sense of smell to learn about our world! If your children have an opportunity to play and learn with any of the activities above this October, please send us a photo of your child and we will post it for others to see!